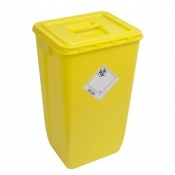 Huge range of waste bins designed specifically for the GP practice, care home, hospice & hospital environments. Foot-operated waste bins to reduce the risk of cross contamination. Mobile waste bins that are easy to transport, empty and clean. Buy a waste bin today with free delivery.